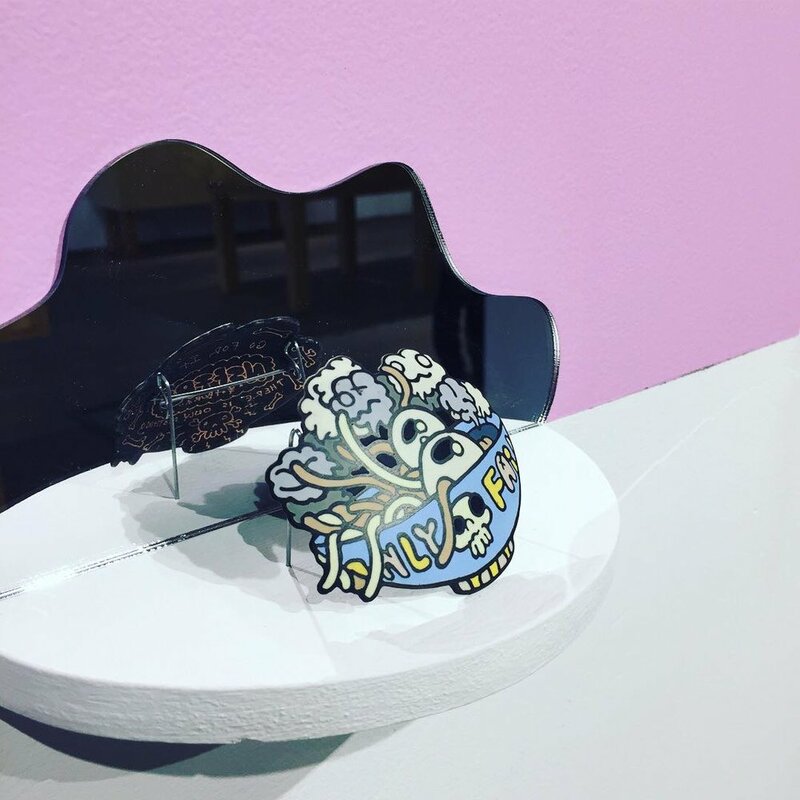 Last month, Montreal’s Galerie Noel Guyomarc’h hosted TOC TWEE, an exhibition reuniting two of the most in vogue enamel artists in today’s art jewellery scene: Aurelie Guillaume and Zachery Lechtenberg. As indicated by the title of the exhibition, which references both “toc”, a French word for cheap or fake jewellery, and the English word “twee”, the common theme explored by the artists is the wonderful world of kitsch. With candy pink wall sections and a large table ornate with a picnic-like cloth, flowers and glittery plastic fruits, Guillaume and Lechtenberg set the tone for the extravagant and garish, yet ironic iconography of their enamel work. The exhibition presented recent works by both artists, some of which were collaborations, and even pieces on which each artist borrowed elements from the other’s illustration style. Although their respective aesthetics may initially appear quite different, the exhibition made it seem like a perfect match. The definition of kitsch implies two main aspects: overloaded and distasteful decoration, and the emblem for unthoughtful mass consumption. Guillaume and Lechtenberg’s work, side by side, complemented each other to epitomize the very definition of kitsch. One one hand, Guillaume’s illustrations are whimsical, presenting fantastic and dream-like creatures and characters enacting the most mundane moments of everyday life. Renowned mostly for her finely crafted and humorous brooches, Guillaume seized the opportunity to explore different forms of adornment, such as a beaded necklace, a set of fake nails and a heart-shaped pendant: all the most glamourous expressions of ostentatious decoration. On the other hand, Lechtenberg’s illustrations are reminiscent of graffiti art and, especially, of the satirical aspect of contemporary cartoon strip aesthetics. Very obviously inspired by street-art and counter culture, his iconography explores the world of vices, junk, and mass culture. Often using personification and symbolism, his work expresses the vulgarity of human nature in contemporary culture. In the centre of the exhibition space was a set of enameled plates, reminding some of Lechtenberg’s past work. Arranged on a yellow and white checkered table cloth, amongst flowers and shiny things, each plate was decorated with a multitude of characters typical to each artists’ fantasy world. The scene thus created carried the visitors away from the exhibition into a grotesque picnic-style dinner party, with its reference to industrial enamelware. The cheap, mass-produced cookware often associated to camping, arguably the ultimate North-American middle-class leisure activity, recalled the roots of kitsch. With that in mind, it is interesting to examine the roots of kitsch as a notable cultural phenomenon, which coincided with North-American middle-class emancipation, its leisure culture and the development of mass production technologies: all of which were relayed through the artists’ thought-provoking yet playful installation methods. Guillaume and Lechtenberg definitely had a field day with the idea of kitsch and pop culture. Although pushing the boundaries of kitsch, every single object on display showed an incredible level of refinement. The traditional nature of enamel and the unique quality of both artist’s drawing styles clashed with the multiple references to mass consumerism and popular culture. The overall exhibition established a fascinating tension between extreme preciousness and gaudy excess.